The recurrent theme of dragons in Balinese art underscores the legendary animal's divinity as the guardian of the gods. Therefore, in Bali, dragons are considered protective creatures. Made Wardika carves the intricate image of bone. It is worn on a necklace of dark brown leather. I love the details on this dragon pendant. I gave it to my brother who is born in the year of the dragon and he loves it! Thank you to Made Wardika for creating such a wonderful pendant. I bought this for my daughter who loves dragons. She loves it! It's so beautiful and intricate. It's such a beautiful and unique necklace. I find it very interesting in the ability to create such beautiful carved detail using bone. This artisan does many artistic pieces using this method which I absolutely love. Not something you see regularly. I've purchased a few of his pieces and love them all. This is a gorgeous dragon pendant, and is actually a little larger than I thought it would be. This wasn't an issue for me because I still love it and have just worn it for the first time...truly stunning! 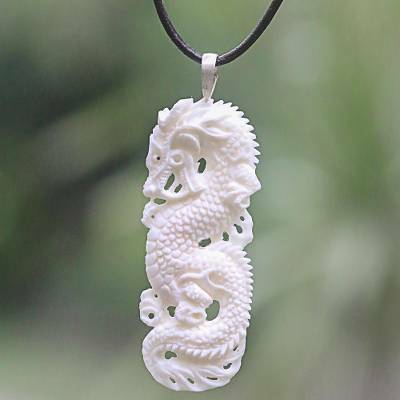 This carved bone dragon pendant is a work of art. The artistry and intricacy defy imagination. It's a large piece and never fails to gather compliments, yet it's lightweight and very easy to wear. It's so versatile, I have mixed it with casual clothes and then changed to a silver chain for dressier occasions as well. I wish to thank Made Warlike for all the talent and care he poured into the creation of this very special dragon. This dragon was purchased as a gift for my daughter. It is beautifully carved and bigger than I expected. I love it and so does she. This is a beautifully and intricately carved piece. A little larger than expected, it is still lovely. What a fun and intricately beautifullly carved peice !!! Very affordable. The dragon lover friend of mine truly cherishes this peice. "A beautiful necklace to wear with casual clothing." Beautilful Pendant, outstanding carving. A way to let Westerners know that the dragon is a positive and protective force in Eastern cultures. Bought this item as a Christmas/Birthday gift (to come) for my nephew, who likes all things dragon. Have not yet given it to him --- may even decide to keep it for myself! The carving is very detailed and intricate, but the back is smooth, and the cord is adjustable, so will be the perfect length for anyoccasion. I am well-pleased with this as a gift and the price was really GREAT!! "this is just gorgeous i love it"
I purchased this piece because I'm very fond of the dragon motif, and this carved dragon didn't disappoint. The carving is lovely. However, it came on a thin double brown leather cord (unlike the photo online) that is very short without an obvious way to open it, and it's impossible to get it over my head. I'll have to cut it and put it on a different cord or chain. This is why I didn't give the piece 5 stars. I bought this as a gift for my daughter as a "you're doing a great job, I'm proud of you gift" and she LOVES it. She keeps picking it up and looking at it and admiring the wonderful detail and the personality of the dragon. Truly a beautiful piece of wearable art. Thank you so much for sharing your talent with the world and I look forward to acquiring another piece from you in the future. Warmest Regards, Chris R.
"Beautiful carving. A true work of art!" This pendant exceeded all my expectations. The carving is intricate and very high quality. Beautiful colour which will only get better with use. I highly recommend this artisan. "Bought this for my mom. She collects dragons." Light-weight. Really a beautiful piece! The detail is wonderful. It is truly a work of art. Really unique & special piece. Intricately carved with great detail. I love dragon jewelry and this piece is completely outstanding. One request would be to use a different cord, softer & a bit thicker, perhaps crocheted. This is so beautiful. The carving is exquisite. So delicate and such rich detail. I recommend this Artist highly!! Thank you so much! "Beautiful piece of art and functional accessory "
I?m simply amazed by the quality and appreciate the details and craftsmanship. Definitely a better experience than buying something mass manufactured by machines.